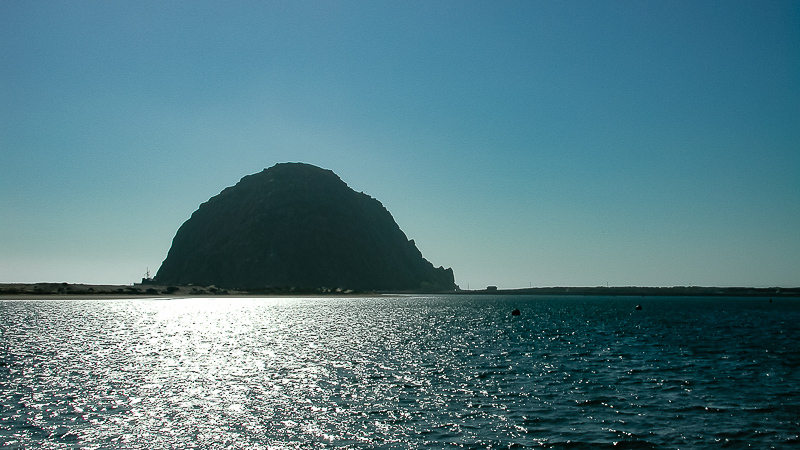 The town of about 10,000 inhabitants called Morro Bay takes its name from Morro Rock, a volcanic plug that rises 576 feet above the ocean and is home to a few peregrine falcons. 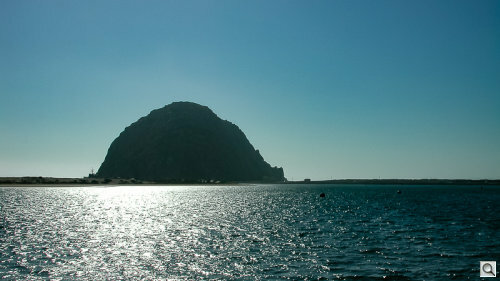 The plug is one in a line of nine such, known as the Nine Sisters. 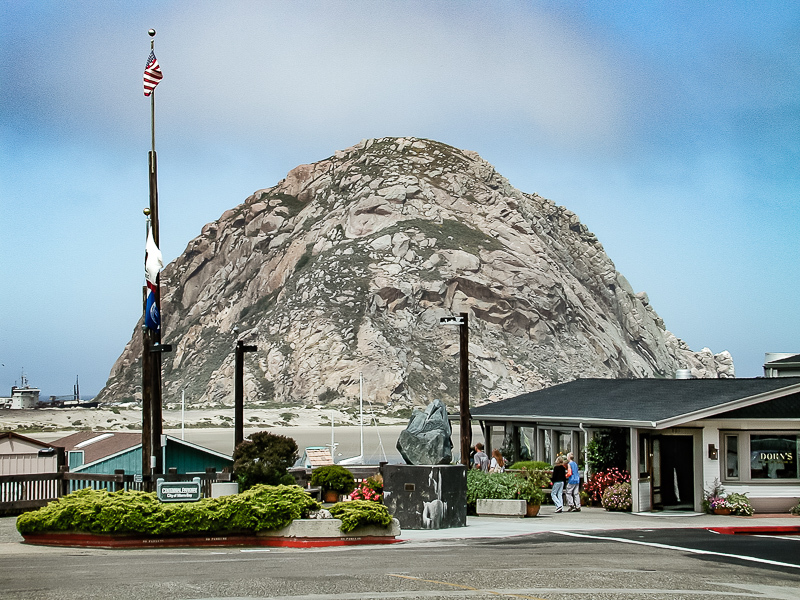 We were there for the motel, which was within driving distance of San Luis Obispo where a nephew had managed to graduate from Cal Poly. And it was so long ago all we had to record the event was a measly Nikon 990. 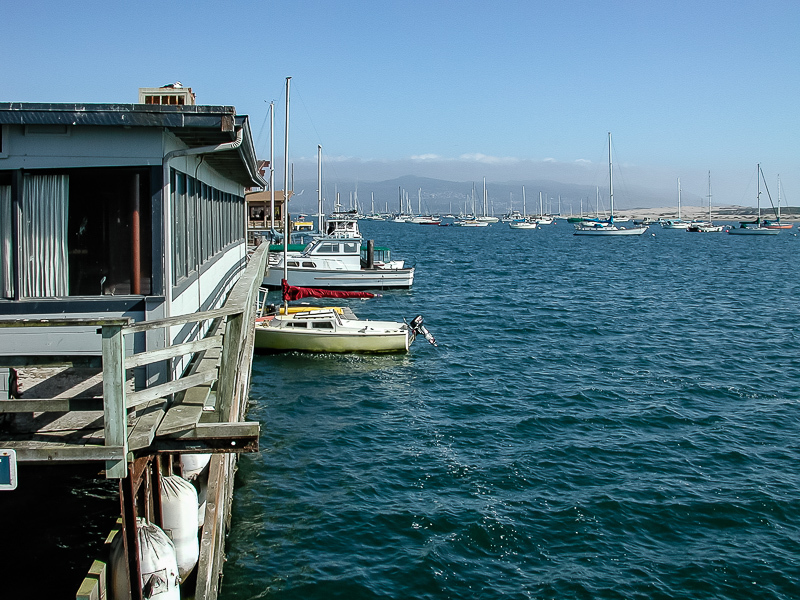 But cheered by our recent edits of three-megapixel images from the 990 using the current version of Lightroom CC, we revisited those 2005 images. And again, tools like Dehaze, Clarity and the Upright tool made a big difference in what you're seeing and what we captured. 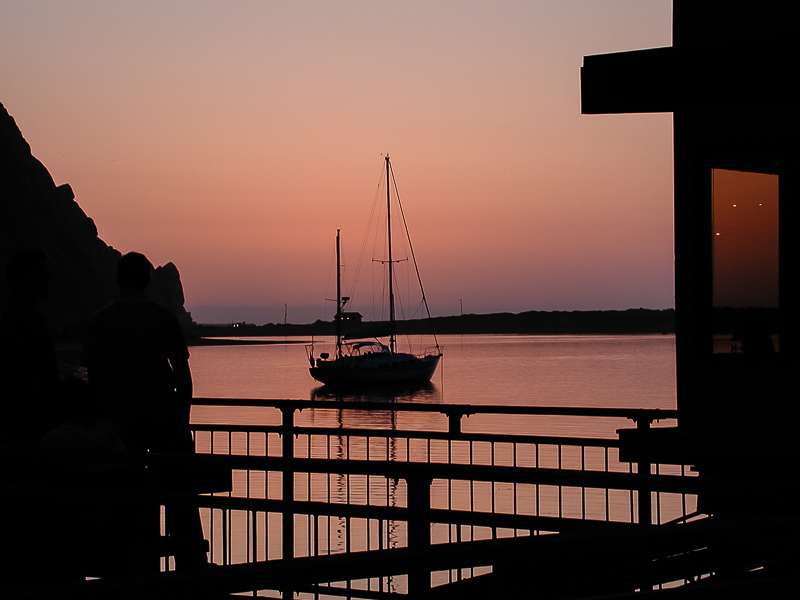 We arrived in the afternoon and had dinner along the waterfront with the rest of the family. We'd all managed to pretty much take over the motel's second floor. 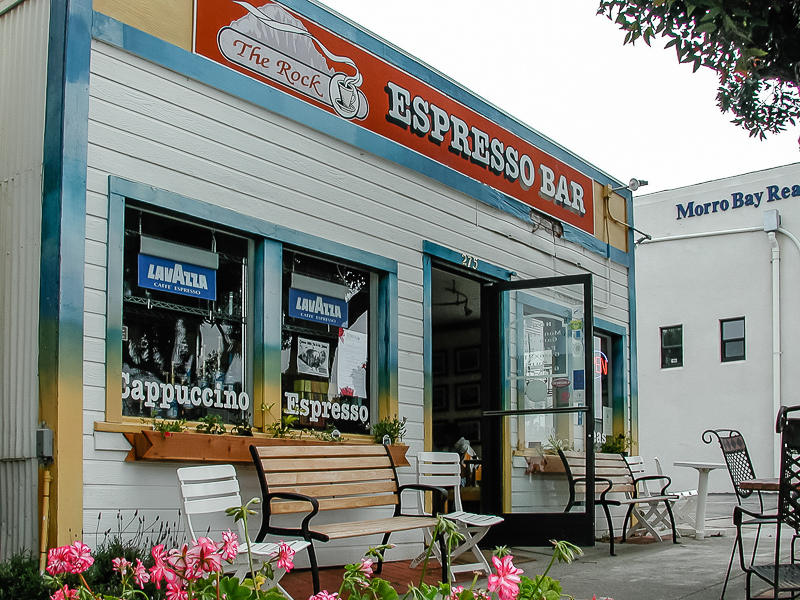 In the morning, a few of us straggled out to the office for the free coffee and pastries before someone had the bright idea to walk up the street to look for a coffee shop where we could convene. We thought about arranging the slide show starting with the morning and ending with sunset but, like our first President, we cannot tell a lie. So sunset occurs in the middle of this show. We could have arranged the show starting with the morning and ending with sunset but, like our first President, we cannot tell a lie. And we start fresh in the morning. 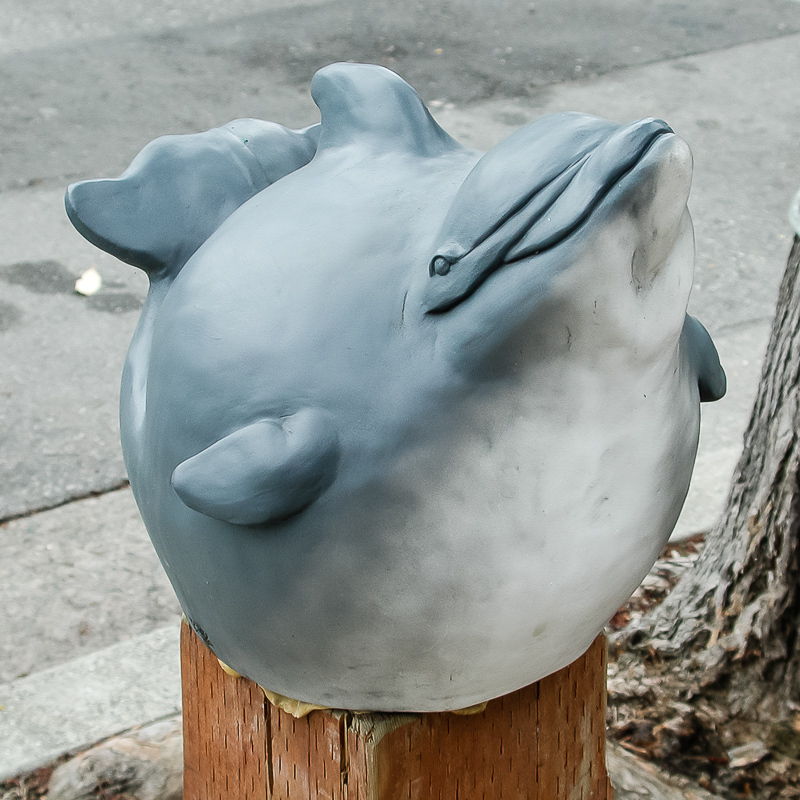 That's when we noticed the peculiar figures posed on posts along the sidewalk. We thought we were dreaming. 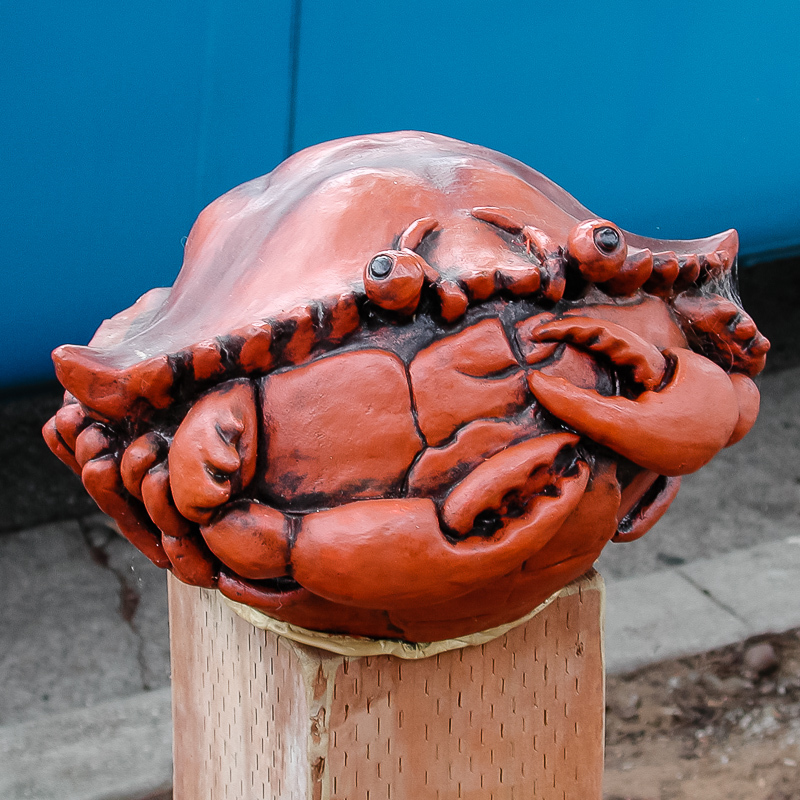 Then we wondered why every place doesn't have something like that. 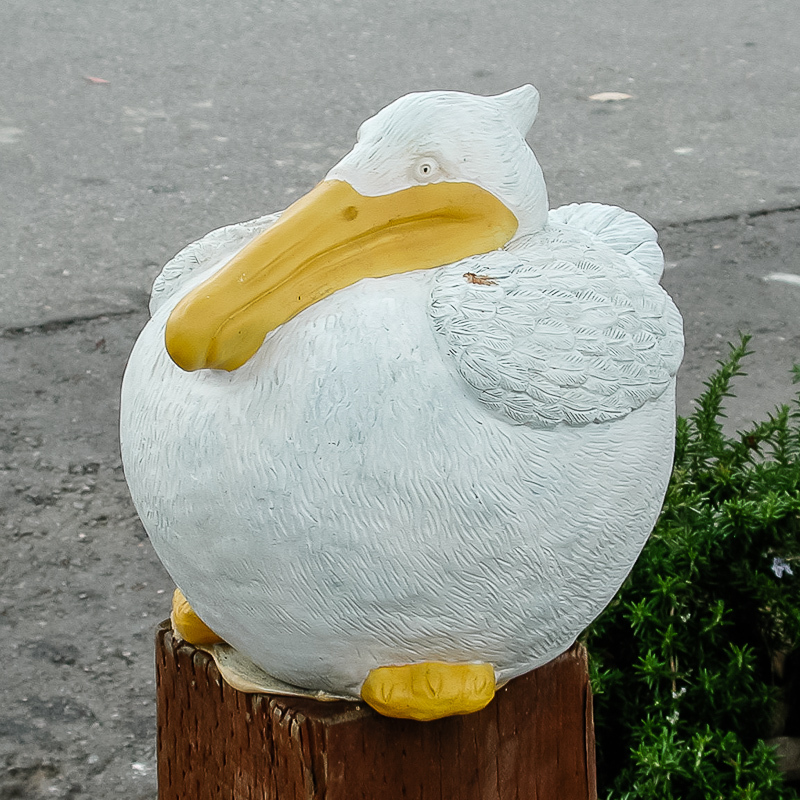 You'll see a dolphin, a crab and a seagull. And you'll want to take them home. 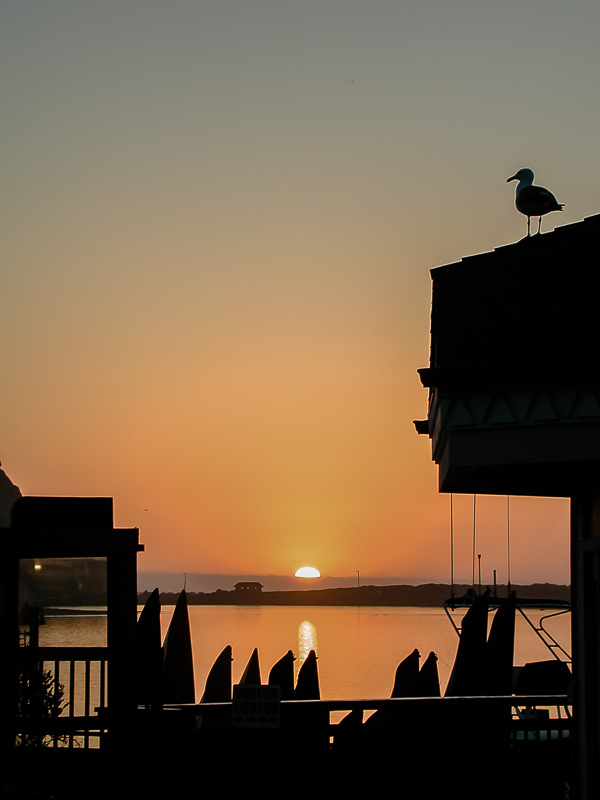 There are a few other images that brought a smile to our face when we revisted Morro Bay in our Lightroom catalog. 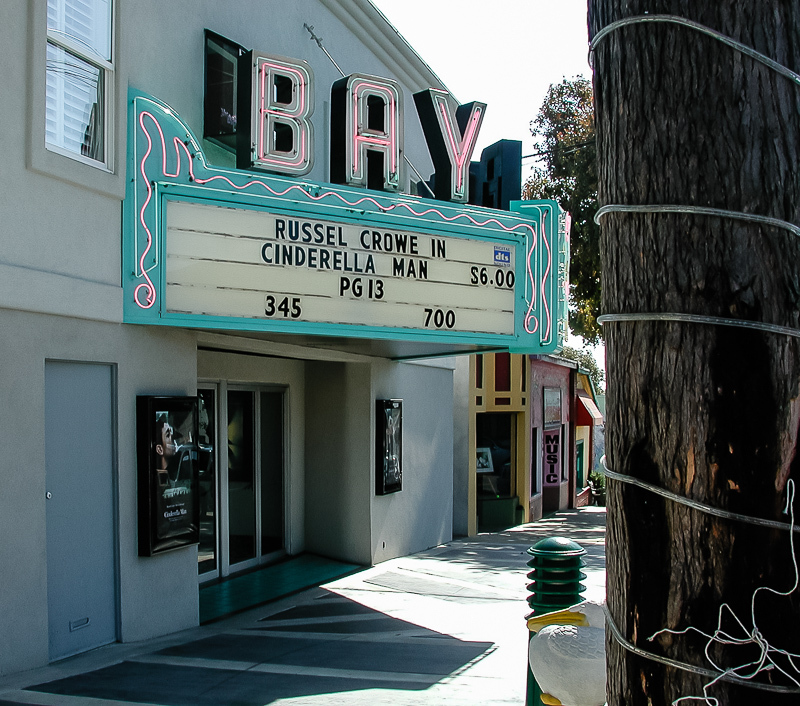 The Bay movie theater was showing Russel[l] Crowe in Cinderella Man for six bucks. The other side of the marque featured Renee Zellweger, who obviously got priority for the theater's few L's. They only had seven, if we counted right. 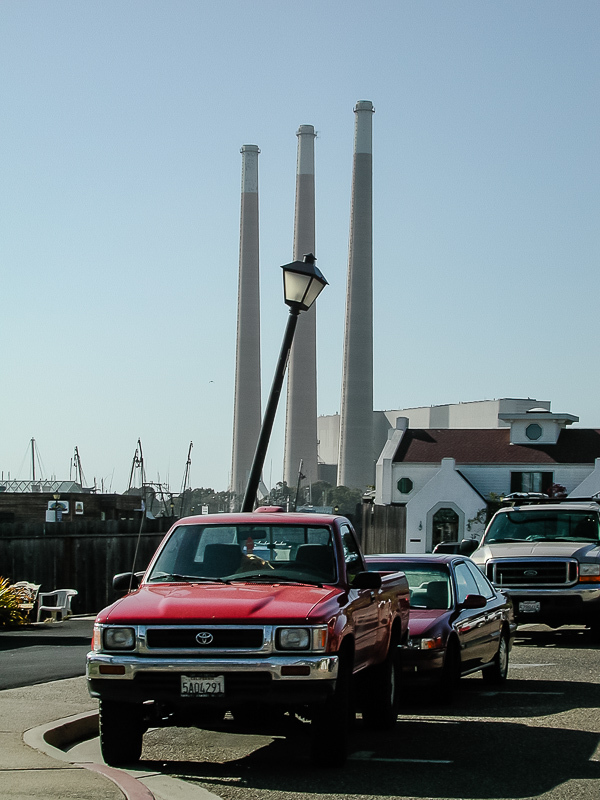 Someone had banged into a old world light post making it a particularly amusing counterpoint to the now abandoned Dynegy power plant's three smokestacks, known as the Three Fingers. 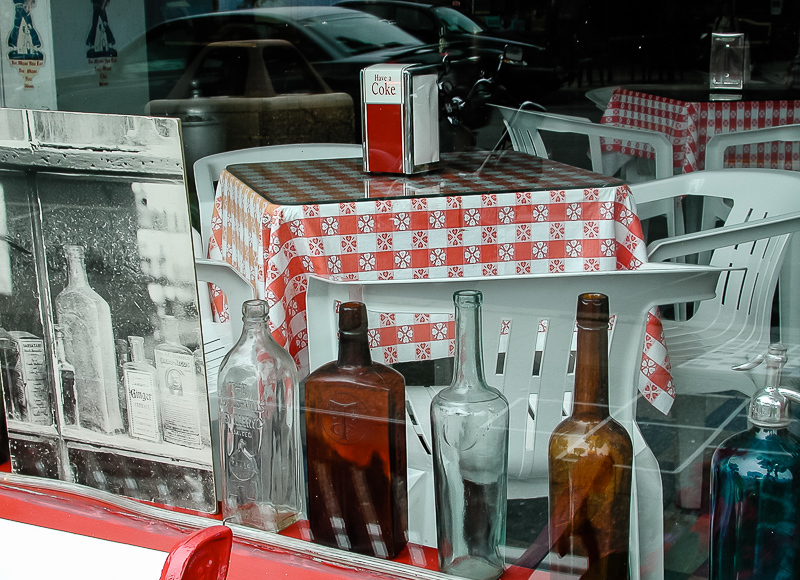 We're not sure why the little restaurant with the bottles in the window bothered to add a black-and-white image of bottles in a window but we took it as a statement championing the photographic art over mere bottle collecting. 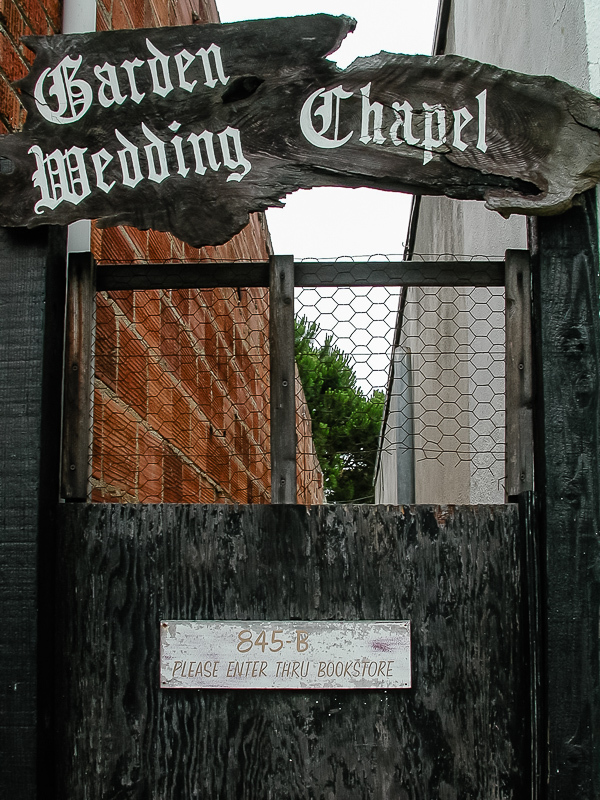 Then there's the Garden Wedding Chapel whose chicken wire fence advises the romantic to "PLEASE ENTER THRU BOOKSTORE." In caps, yelling, because, you know, people about to get married are just not paying attention. 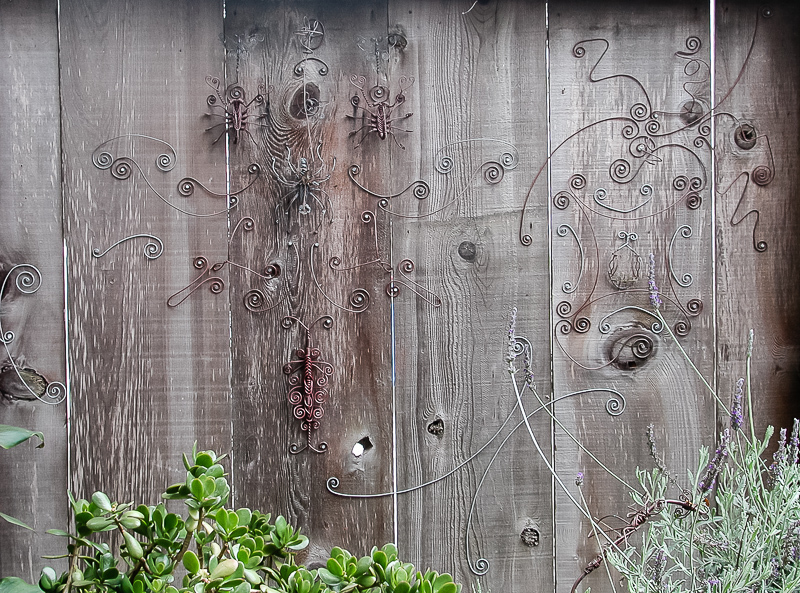 That Garden had some lovely ironwork on the wooden fence, too. 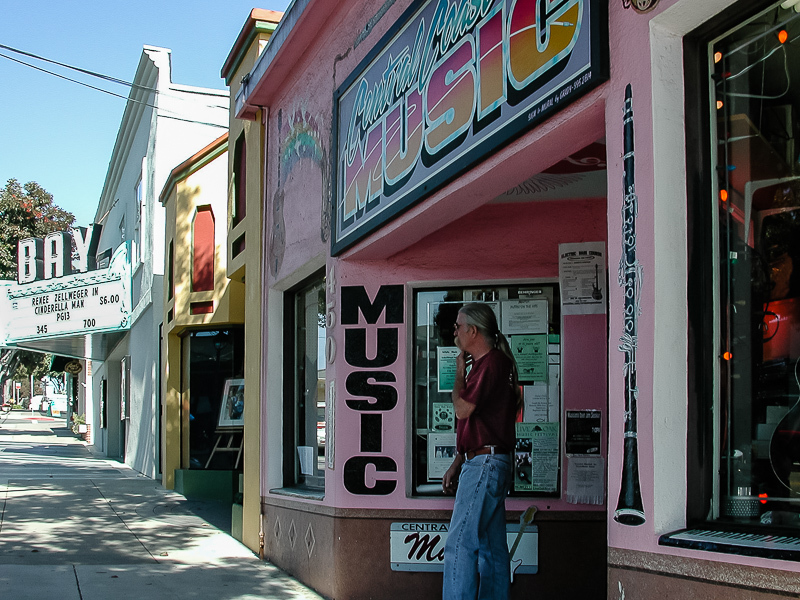 Who does that kind of thing, we wondered, as we sipped an espresso and listened to the family patriarch talk about playing clubs in New York City long ago. It was a delightful day. And, come to think of it, maybe that's the way we should count every day. Start the day in the afternoon, go to dinner, have a good eight hours of sleep right in the middle of it, then get up, find some coffee and enjoy life until noon flips the calendar on you.